There was no plan, there was only "concern about animals and nature," says Gene Baur. "I wanted to do something positive it the world." He did. In 1986, he co-founded Farm Sanctuary. Now almost 30 years later, Farm Sanctuary is America's premier farm animal protection organization, a safe haven for factory farm animals abused and/or left for dead, and a transformative place for people, too. Farm Sanctuary offers education, outreach and the opportunity to rediscover our primal bond with animals. "Farm animals are not that different from cats and dogs," says Baur. "They have feelings, relationships, respect and compassion." Their open affection remind of us our own humanity. And our responsibility. "We don't share our lives with animals just because we want to. We do it because we need them," Baur writes in Living the Farm Sanctuary Life. Co-written with Gene Stone, Baur's new book provides a little Farm Sanctuary wherever you are, with adorable farm animal photos, pleasing plant-based recipes from fab chefs and cookbook authors including Chad Sarno, even one from Baur. And of course, transformation. Taken together, it's a recipe for "compassionate vegan living. You can live and do well without meat." And it's easy. "Try Meatless Monday, substitute meatless meats for meats," Baur suggests. "Small changes lead to bigger changes." One small change that's helped lead to bigger ones and greater vegan acceptance is the current state of vegan eats, more accessible and more delicious than when Baur went vegan in 1985. One thing hasn't changed in three decades. "Health," says Baur, "is the biggest driver." You want healthy? Hello, powerful plant-fueled athletes like David Carter. Rich Roll, Ellen Jaffe Jones, even Baur, who's been running marathons and triathlons to prove vegan and buff go together. Farm Sanctuary's undergone other big changes. In addition to the original site in Watkins Glen, there's now two more animal sanctuaries in California. That's more than 500 acres of land for happy, healthy animals. Along with expanded acreage is expanded awareness. "It's an exciting time," says Baur. "People are starting to think about the impact of animal agriculture on nature and that's a very good thing. People want more mindful choices, there's more momentum than ever, a convergence of awareness. That gives me a lot of hope." Now as it enters its third decade, Farm Sanctuary is working to reach more people, from the underserved to "people in urban places," as well as tying in to existing and emerging trends. They're all little steps which taken together "catapult it to the next level." As Farm Sanctuary evolves, its goal remains the same. "To save animals' lives," says Baur. "One of the best ways to do that is by not eating them. They're our friends, not our food." 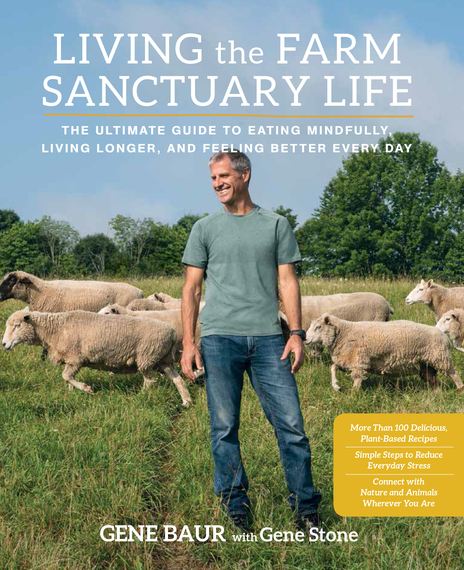 Reprinted from Living the Farm Sanctuary Life by Gene Baur and Gene Stone, copyright 2015 by Farm Sanctuary. By permission of Rodale Books. Bauer's sole culinary contribution to his new book and a family favorite, an awesome, animal-free version of the "wonderful Sunday morning family breakfasts of bacon and eggs when I was growing up." In a cast-iron skillet over medium-high heat, add about 2 tablespoons water and cook the onion, bell pepper, and garlic. Stir frequently and add a 1/8" layer of water (it will steam off) to prevent the veggies from sticking. When the onion is translucent, add the mushrooms. Continue stirring and adding water as necessary. When the mushrooms boil down to approximately half their original size, reduce the heat to medium and add the tofu, nutritional yeast, salt, and pepper. Continue stirring frequently, mixing and adding water as necessary. When the tofu, spices, and veggies are mixed well and heated evenly, after about 5 minutes, add the turmeric and continue stirring and adding water to prevent sticking. After the tofu attains a uniform yellowish color, mix in the spinach, which will boil down to a fraction of its original size. Then enjoy! Variations: Feel free to add other veggies or more of the veggies listed above, which will make the dish less protein dense. 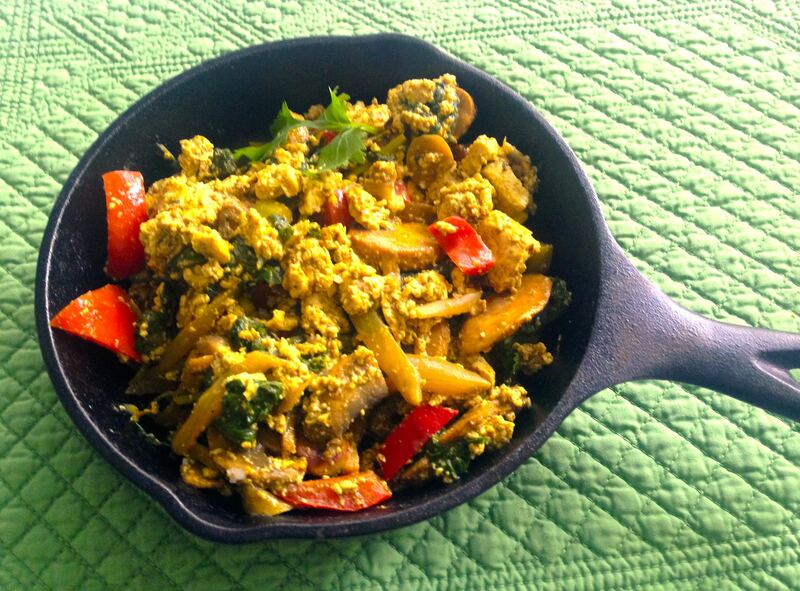 You can also add vegan sausage, like Tofurky or Field Roast, if you want a heavier dish.